Special Counsel Robert Mueller’s now-concluded investigation into the Trump campaign and Russian influence over the 2016 presidential election was obviously a hot topic on Twitter. More than 400,000 tweets — an average about 600 per day — mentioned the word* “Mueller” since the former FBI chief was appointed to lead the investigation in May 2017, according to a dump (190MB csv) of verified user data pulled from the social network using Python and Twint. You can download the data here (190MB csv). * This data dump, due to my general laziness and day job duties, includes a bit of noise from misspellings of the the German footballer Thomas Müller’s name and some other unrelated “Mueller” tweets — about 60 a day, I would say, on average. You get the idea, though. Despite all the controversy attached to his presidency, Donald Trump has managed to retain a relatively consistent approval rating in the last two years — especially when compared to predecessors in the modern era. The president’s approval rating has climbed some in recent weeks after a significant decline in January, reverting to around the average during the last two years. Perhaps it’s the tribalism in American politics or the fragmented news ecosystem or the president’s skills as a communicator — but, for some reason, Trump hasn’t experienced the wide fluctuations of his predecessors. He also, of course, remains historically unpopular. According to Gallup, the president’s rating changes have stayed within a 14 percentage point range. Other presidents — even those who only served one term — have experienced wider swings in their popularity over time. The late George H.W. Bush, for example, saw his popularity drop from 89% in February 1991 to 29% the following summer, a massive change. A trade war could be looming between the United States and China, fueled by President Trump’s fixation on the two nations’ unbalanced import-export relationship. The trade imbalance between the two countries — which might not hurt the United States that much — stems from the fact that China sells more to us than it buys, essentially. That’s largely driven by macroeconomic factors, not some malicious intent: China is a low-cost manufacturing powerhouse, and the United States is an economy dominated by domestic consumption. These charts help explain the $570 billion overall trade relationship between world’s largest economies. First, here’s how the trade has changed over time. The United States imported $460 billion in goods from China last year. That figure has steadily increased in recent decades as China emerged as Asia’s top manufacturer. Exports from the United States to China, which doesn’t yet have the same per-capita domestic consumption as America, haven’t kept pace (again, not that we should be worried). Here’s the same data, told with a column chart. It shows trade between the two countries in proportion. About 20% of our trade with China last year, and over recent years, has been from exports. Imports represent about 80% of our goods exchanges, on the other hand. The resulting balance of trade, or trade deficit in this case, has also grown steadily over the years. These charts show the change, year by year, since 1998. Red bars represent the growing trade deficit in billions of dollars by month. This measure — the trade balance — varies widely by country. One way to examine the relationship with other countries is to look at the balance in the context of the respective total trade. How much does the balance represent as a percentage of overall transactions, for example? These charts show that figure for America’s top-40 trading partners in 2008. Blue bars reflect a positive trade balance for the United States. Red bars mean it suffered a trade deficit with a particular country in a given year. When examined this way, you can see that China isn’t the only country in the world to sell more to Americans than it buys. China’s deficit might be huge — its population and output is quite large — but the trade deficit looks similar to other countries figures when viewed proportionally. Promo background image courtesy Keith Roper. 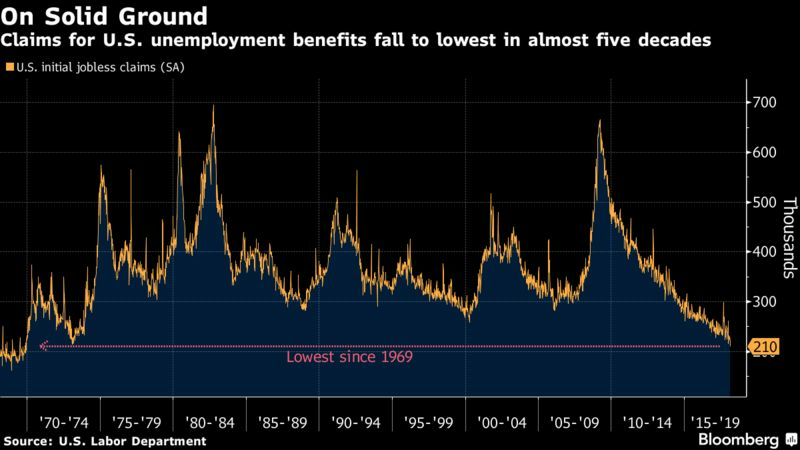 The number of Americans filing claims for unemployment benefits hasn’t been this low since Richard Nixon was president, according to new data from the U.S. Labor Department. Image courtesy @bytemarks via Creative Commons.